Fronds are triangular. Elegant plant for greenery in humusy, shady spot. Will spread easily by rhizomes in optimal conditions. Provenance: Kentucky. Dark green clusters of evergreen fronds provide winter & textural interest. Good choice for massing & on slopes. 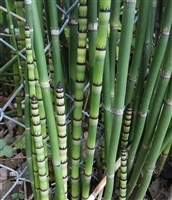 Easy to grow, the clumps increase in size but do not spread. 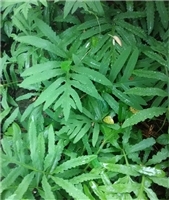 In nature this fern grows in wet areas such as along streams or wet woods. Can grow in average soil that doesn't dry out. May spread by rhizomes. Provenance: Kentucky. 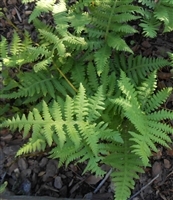 Also called Marginal Wood Fern, this plant is non-spreading and forms tidy rosettes. It stays green through winter months and is excellent in groups. Reproductive structures can be found on the underside of the fronds, along the margins. Hence the species epithet.